Crop Circles - Fake or Real? It may seem unlikely to some that there is anything beyond the reality of our 5 senses, but our awareness on this level, is very limited. The belief that something or in fact 'anything' is 'not possible' comes from our mental programming and is a non-intelligent limitation. We are all multi-dimensional Beings in an infinite Universe. There are extraterrestrial Beings which originate from other solar and star systems. 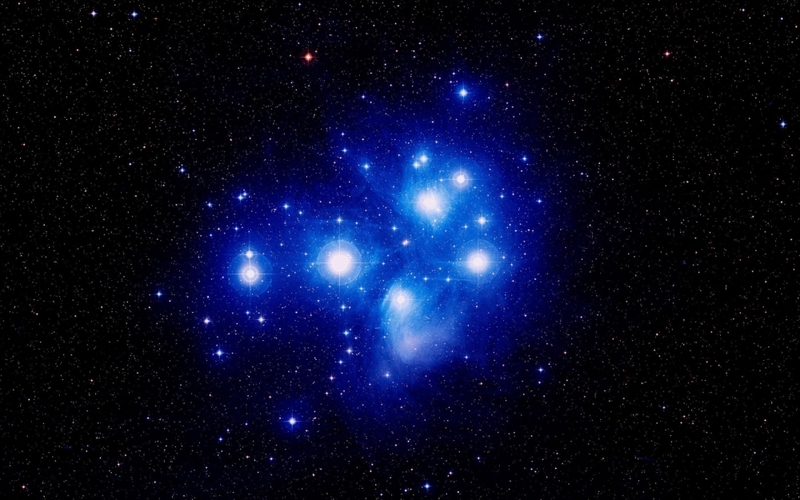 They are very real and they are our Galactic family. The Milky Way is formed from an estimated 100 billion stars, and 100 billion planets. Then of course there are another 250 billion galaxies. Something not possible? 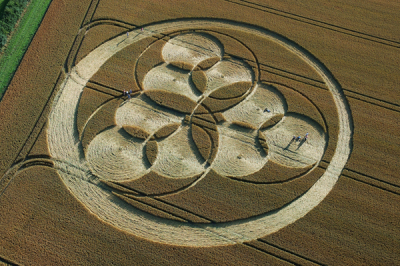 I have had some very interesting encounters and experiences when visiting crop circles. Experts can determine the difference, and one criteria is that circles of 'unknown' origin, ie extraterrestrial, have heightened electromagnetic frequencies. Recently though it was found that the electromagnetic frequencies in a crop circle which was proven to be man-made, was as high as the measure in genuine crop circles of 'unknown' origin. People were puzzled. In 2006 I visited a crop circle at Windmill hill near Avebury. It was only the second formation I had ever visited. It was poorly designed and undoubtedly man-made, though at the time I did't know any better and I assumed that all crop circles were of extraterrestrial origin. It appeared that like myself, other visitors to this circle thought this too. At sunset everyone else visiting the circle left. I walked around the entire formation and I was aware of a presence - another conciousness within it. There is a point in time after sunset when the balance of light and dark is equal. If you are very sensitive you can actually sense this. Its very brief. It was at this point I was asked (telepathically) if I wanted to remain in the circle, and said 'yes' (would I have missed it?). There was a huge surge in the energy within the circle and felt it spinning around the formation. It was very powerful - so powerful that I was sure I was going to lose my balance and so I got down on my knees for safety. I sensed that this energy was purifying the circle. I felt that this circle was being used by more evolved Beings to heal the human visitors' emotional issues. I slept the night in it. It was avery clear crisp starry night.I wrapped a sleeping bag around me and fell asleep. I woke up in the early morning hours. I was staring directly at the starry night sky. One point of light caught my eye. I would have assumed it to have been a satellite as it was moving in a straight line, only after a while, it stopped and then began travelling back in the opposite direction, then it stopped again. I then became aware of 3 Beings - human in appearance, one female and 2 males, very tall, dressed in long gowns of light. They were contained within a bubble which had been projected from the 'satellite'. The vision faded after a short time, and the 'satellite' shot off the night sky at a phenomenal speed and disappeared. My reason for giving this account is that I am certain that many man-made crop formations are a co-creation which is why there are the heightened energy readings in them. Whether the human crop-crafters are open-minded to ET reality or not is irrelevant. I believe that the design and location of such circles are heavily influenced by our extraterrestrial friends. The designs often incorporate sacred geometry. But why would the extraterrestrials use these crop circles at all? After all, they are well capable of manifesting beautiful formations in seconds, without the intervention of human circle makers. They have done that many times, and still do. The fact is that by co-creating with the humans, the higher dimensional consciousness is able to anchor directly into the current levels of humanity consciousness via these formations as they are being constructed. That is a level of consciousness which the higher dimensional Beings do not naturally access. This creates a 'bridge' to higher levels for the visitors, helping to raise their vibration and consciousness. The people making the crop circles are as much a part of the crop circle phenomena as everyone else involved - including the visitors, farmers, and investigators of mysteries. We are all starseeds - all finding our way back Home. Crop circles affect and heal the energy of the landscape. The genuine ones are interdimensional portals and stargates where you can meet and communicate with Star Light Beings - our extraterrestrial family. Multidimensional experiences are available to anyone who has the openmindedness and desire to reach beyond 'normal' accepted reality threshholds. They just have to ask. For those who live too far away to visit these formations, I understand that the images can be used as meditation tools The genuine ones (and possibly others!) are encoded.